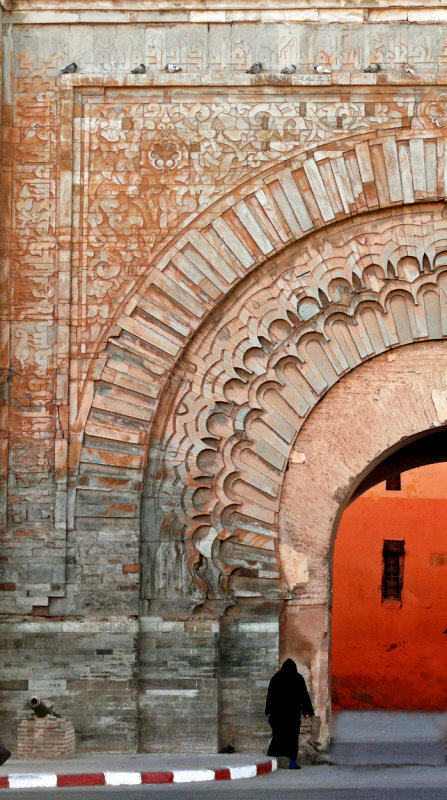 The most beautiful gate in the ramparts of Marrakesh, this 900 year-old arch once led to the Royal Palace. Its carved sandstone still shows tinges of red, melding with grayish blue. The sculpted facade consists of alternating layers of stone and brick. To make this gate speak more effectively, I abstract the image by cropping it exactly in half. I kept the half with the person about to walk through the gate to offer a sense of how huge this gate really is. The elaborate detail on its façade tells still another story, and makes another image unto itself. You can see it by clicking on the thumbnail below. You must be psychic, Jenene. If there is any spot in Marrakesh that is haunted, it is the Bab Agnaou. It was here that the severed heads of the enemies of the sultans were once displayed. The figure in black is ghostly, and can also be seen (apart from her religious context) as someone in mourning. The red and white curb is a warning -- keep away. The canon is a killing machine. No wonder this image make you feel "uneasy." I get a very uneasy feeling from the elements in this image. The warm color of the arch itself is quite a contrast to the canon, the graphic red and white curb and the strong red beyond the opening. The figure in black with back turned also serves to keep me away. It is intresting that Zandra was speaking of the raven's role in Nordic mythology today in her comment on my Yellowstone raven image athttp://www.pbase.com/pnd1/image/69220660 Now you show me a shot of a raven that you made at Yellowstone that corresponds to the spirit of this woman in black. It is as if Morocco and Yellowstone have become linked by the spirits inhabited by ravens. I agree -- both the raven in your image and the woman in mine function as spiritual symbols. In some ways this reminds me of my image of Old Faithful from Yellowstone ( http://www.pbase.com/mityam/image/70370750 ). The black and ominous figure in each image speaks of the shadow that is present if all things ancient and beautiful. A great peach peacock! What a wonderful characterization of this iimage. Glad you picked up the pigeons up top. They look as if they have been there for centuries. Thanks, Ceci, for bringing your imaginationi to this old arch. The photo was not made in the evening -- rather, it was the morning light you see here. The entire image is actually in shade, but relected light is bathing this arch in that glow. I love all the elements mixing it up in this amazing picture! The brash red/white modern curb, a cannon from another era, the fanned arch like a great peach peacock tail, the subdued pigeons nestled against the stone at the top, the carved gate alight in the evening sun and the black-clad figure heading into a glowing interior. It's a quiet scene with SO MUCH going on! Gorgeous balance, framing, illumination. Wonderful! Thanks, Judy, for these observations. I shot the entire arch, and then cropped it in half with photoshop to make it work as an abstraction. I did not adjust any angles in post processing, however. That kind of work is beyond my skill level. The only things I can adjust in that regard is with cropping, tilting, etc. did you adjust the anglesin photoshop?